I've been really good lately at not buying too many books. I feel like I put a fairly large dent in my TBR pile in the last few months and since I had a 15% off coupon at Half Price Books, I decided to treat myself. Ham on Rye, Charles Bukowski: This will be my first Bukowski and word has it, it's one of his best. "From a harrowingly cheerless childhood in Germany through acne-riddled high school years and his adolescent discoveries of alcohol, women, and the Los Angeles Public Library's collection of D. H. Lawrence, "Ham on Rye" offers a crude, brutal, and savagely funny portrait of an outcast's coming-of-age during the desperate days of the Great Depression." The Unabridged Journals of Sylvia Plath, edited by Karen Kukil: I've had my eye on this one for awhile and I'm so happy to have found it at Half Price Books for $9.98. A steal! A Reliable Wife, Robert Goolrick: This one was in the super buys section, so I paid $3 for it. I've seen it around but couldn't remember whether or not got favorable reviews. After a quick look on goodreads, it doesn't look like a lot of people liked it, but I'm still willing to give it a shot. Armageddon in Retrospect, Kurt Vonnegut: A collection of Vonnegut's unpublished writing published posthumously. Before you Suffocate Your Own Fool Self, Danielle Evans: I'm not going to lie, I bought this collection of short stories purely because the title is freaking awesome. I had to give it a shot. I'm a HUGE fan of Robert Goolrick. I LOVE LOVE LOVE A Reliable Wife and CANNOT WAIT for the next book - Heading Out to Wonderful - to come out in June. I really hope you like A Reliable Wife. It's different - a little melancholic and dark at times, but MAN what a story! Okay that is good to hear! I saw so many two star reviews I thought I made a mistake. But the premise does sound so good! Thanks for your feedback! I don't have much to say about any of these books (cause I haven't read them, not because I hate them or anything!) other than that I am intrigued by the Journals of Sylvia Plath, even though I'm a bit iffy about reading journals in general. I hated A reliable wife. I thought it was a dark gothic tale but it turned out to be a cheesy Harlequin. The worst book I've read this year, the other ones being way ahead. Anyway, I'm curious to see how you find it. Laura it is kind of cool! It's the Penguin Ink edition. I'm only 40 pages in, but I really like it. I have yet to read an Auster that I don't really, really like. Hooray for new books, especially on sale discounted books at that! 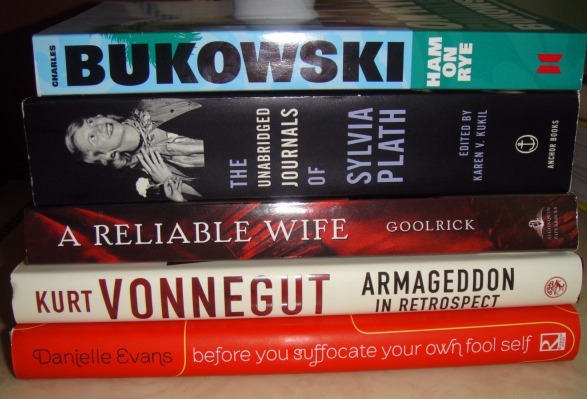 I haven't read any of these but I'm super excited to hear your thoughts on the Vonnegut one. Happy to be of inspiration, Greg :) Even happier to hear you loved Ham On Rye! I have Plath's diaries in the same edition and I've been about a third of the way through for about ten years now! They are hard to read but worth the effort, I should go back to them one day. They did look pretty dense but like I said, I've had my eye on them for awhile so I couldn't pass up the discounted price! Ham on Rye is really good; "crude, brutal, and savagely funny" are definitely sum it up! I'm dying to read The Unabridged Journals of Sylvia Plath; I can't wait to hear your thoughts! Love Vonnegut, didn't know there was a collection of his unpublished works... interesting, I might have to read. I'm so happy to hear all these good things about Ham on Rye! Wow that's a hike for some book trading! How does it work? Is it a store that trades gently used books? Is it 100% free? It's the enormous book store I've posted about before. It literally looks like a giant warehouse, but you can find really new books for really cheap. I got 11/22/63 there for 10 dollars shortly after it was released, in perfect condition. They buy almost anything. I got $32 in trade money for 10 books last time I did so. We like making the trip anyway because it's fun, but the book aspect makes it even better. Okay that is kind of like Half Price Books! You can take in books, dvds, magazines and sell them back for cash or store credit. I usually sell the books I don't like back, but hang on to the rest for my ever-growing collection. Though it sounds like the place in Chattanooga gives you a little more for your books than half price does. I really enjoyed Armageddon in Retrospect, and I have that same edition of Sylvia Plath's journals on my TBR pile that I plan to read this year. That's a great pile of books! Bukowski might make you cringe a little (he was a jolly ol' drunk with a fine taste for women), but I think you're going to get a kick out of it anyway. I picked up Ham on Rye for my Kindle a few weeks ago. I read the *abridged* journals of Sylvia Plath when they came out and have always wanted to read the unabridged. A Reliable Wife is a fun, discussion-worthy book. It has issues, but that's what makes it fun to talk about. Great buys! Enjoy! i read everything bukowski wrote when i was in college after reading john fante's "ask the dusk" and hearing that bukowski was a massive fante fan (sat with him on his deathbed). it's definitely a different style, one that many wouldn't call literary (which is probably why it got so much academic attention AS literary way back when). all-in-all, it was just plain fun to read... and ham on rye of them all is certainly the most revealing and emotional, even tragically sad to balance out all of it's crude/humor. definitely no sense of political correctness about 'ol buk though... and he's been known to be a man's writer if there is such a thing. i'll be curious to see what you think... i can certainly recommend of a couple other books of his if you like it. and if you don't, it'll be done quickly at least. curious about the vonnegut... haven't read that one. used to work in the same building he worked in (well before my time) when i lived in upstate ny... always loved his stuff. will check back here to see what you think on that one too. I *really* liked A Reliable Wife, but also kind of unexpectedly. I didn't think I would enjoy it, but I did! It's a little over the top, in a good way.